Father’s Day comes at the perfect time for some Al Fresco dining, and we all know that outdoors is Dad’s favorite place to be (next to the BarcaLounger). We’ve got some suggestions from Hudson County to Atlantic County, and our favorite places in between. Escape to the shady, secluded backyard at Bin 14, Hoboken’s first and only wine bar. Savor Chef Anthony Pino’s modern Italian tapas and sip one of 80 wines by the glass or an artisanal cocktail. Outdoor seating for 40 on two glassed-in patios (one with its own bar!). Bergen County diners can people-watch while enjoying the restaurant’s Contemporary New American cuisine with an Italian twist. The outdoor bar and barbecue grill is featuring a new casual, economical menu featuring hot dogs and hamburgers, sausage and salads. Gorgeous setting conveys a rustic elegance; brick courtyard with an oversized fieldstone fireplace; wrought iron umbrella tables arranged on on the bluestone patio; bar crafted from timber and stone with black louver accents. Damaged during Superstorm Sandy, Maritime Parc’s outdoor bar has been completely rebuilt. Overlooking Liberty Marina, the Hudson River, and the glorious Manhattan skyline, the restaurant’s al fresco space seats 60 for à la carte dining, 30 in the bar area. Also available for private cocktail parties or dinners for 100-200 guests on Monday and Tuesday. Pilsener Haus & Biergarten brings the old-world biergarten tradition to life. Meet old and new friends at sunny communal tables with frosty mugs of premium draft and bottled craft beers and sizzling sausages from the grill. 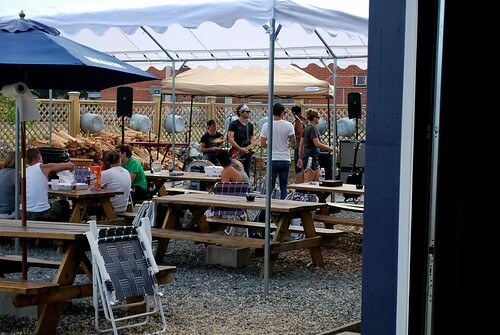 Porta in Asbury Park takes their outside dining so seriously, they’ve dubbed it “Porta Park.” Porta is a place to go for inventive pizza and pasta, very healthy and delicious salads and lot’s of fun: live bands, bocce ball, picnic table dining inside and out, and so much more. This Contemporary American gastropub features a grand covered slate terrace that seats 50 and overlooks panoramic views of the challenging 271- acre municipal course known as “the home of public golf in New Jersey”. The new restaurant showcases the Garden State’s bounty of fresh farm produce, Jersey shore day boat catch, specialty meats, fine chocolates, cheeses and beer. On June 4th, Sam Mickail’s CUT Steak House will launch its After Work Patio Party on the 5,000 square-foot patio. Think cool drinks + small bites in one of the dozen Miami-style cabanas, surrounded by palm trees with great contemporary sounds in the air. The Patio will be open Tuesday-Friday 5.00-7.00 pm. Score one of the few marble-top bistro tables outside Ilson Goncalves’ Brazilian restaurant for an even more charming experience than you’d have indoors. Nighttime features twinkling white lights, candles and truly authentic homestyle Brazilian cuisine. This Margate beachside mainstay jumps in the spring and summer with their large tiki deck and raw bar offerings, along with tons of other great bar offerings like juicy burgers and fries and all the rest. The place to see and be seen in the heart of the summer. Enjoy your favorite libation as well, right next to famous Lucy The Elephant the iconic mascot, larger than life NJ attraction which was designed to be a hotel where you could look out the pachyderms’ “arse” through a window in your room! What more could you ask for?! Check for times and dates of opening due to weather and season. Be sure to visit Kelly at The Boondocks this summer as she reopens after being washed out by Hurricane Sandy. Currently in the process of renovations, The Boondocks is expected to be open this summer. Diners will enjoy fresh lobster while sitting outside on the deck overlooking Marine Park and the Shrewsbury River. Bring your favorite bottle of wine or six pack of beer and make it an evening with friends! Find them on Facebook for opening dates.